10 New & FAB Ways To Style Your Saree This Shaadi Season! Shaadi season calls for experimentation and innovation with your Indian wear. Whether it’s your best friend’s wedding, your next door neighbour’s or that aunt's brother-in-law’s son’s wedding that you don’t want to go for, but still have to. 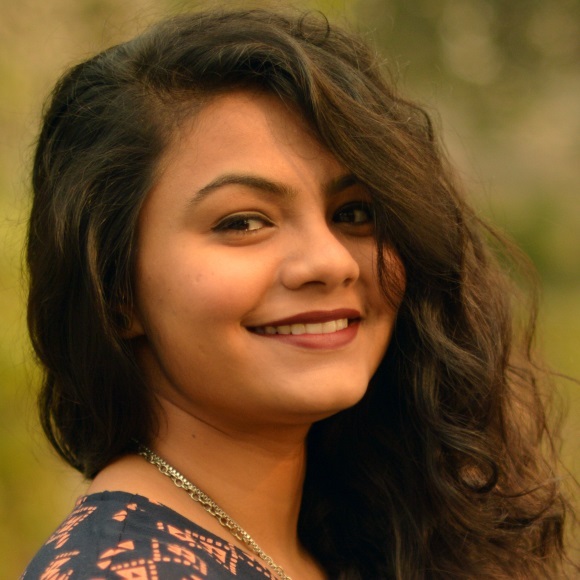 There’s a saree for every occasion, and a styling trick to look your best in it, too. Wondering how to style a saree this wedding season? Worry not! Here are 10 amazing ways you can get some shaadi swag on! 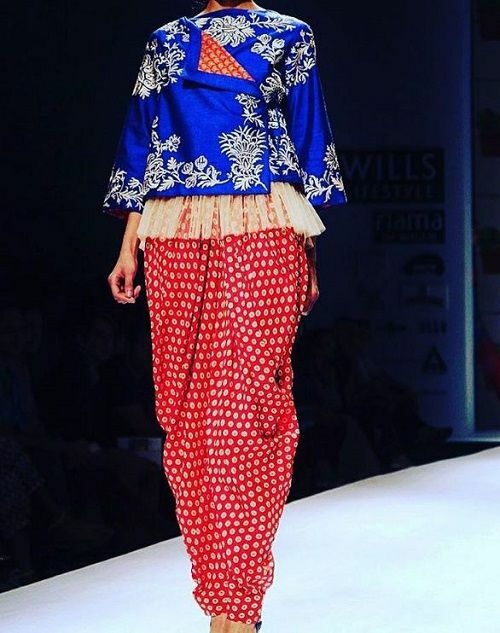 Image: Abu Jani Sandeep Khosla on Instagram Ditch the casual blouse and opt for an interesting one like this instead. Try a risque sheer blouse with applique work all over the sheer panel. It looks even better if you’ve paired it with a plain saree in the same colour as the colour of the work on your blouse. 2. 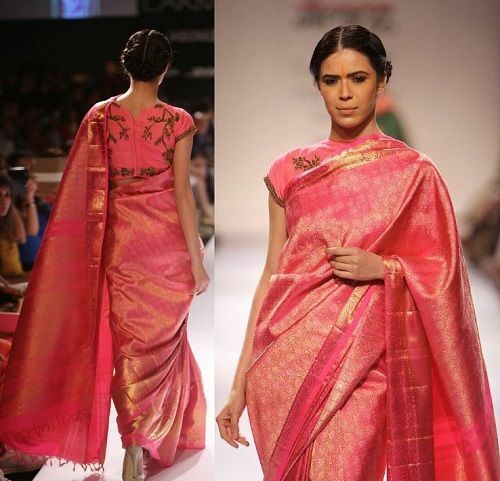 A fluid yet structured pallu! Image: Rhea Kapoor on Instagram Because regular pallus are so passe. Try combining a different pallu - varying in colour, size or fabric to make your saree style stand apart. You can even try an all-black maxi dress and drape raw silk fabric in a different shade like a pallu, to achieve Sonam’s look here! Image: Ekaya Banaras on Instagram You don’t want to freeze at winter weddings but still want to make a great statement? Throw on a dark blue denim jacket on top of your bright, shimmery saree. You could do your hair in a messy bun or even do a faux bob. This look is sure to get you tonnes of compliments! 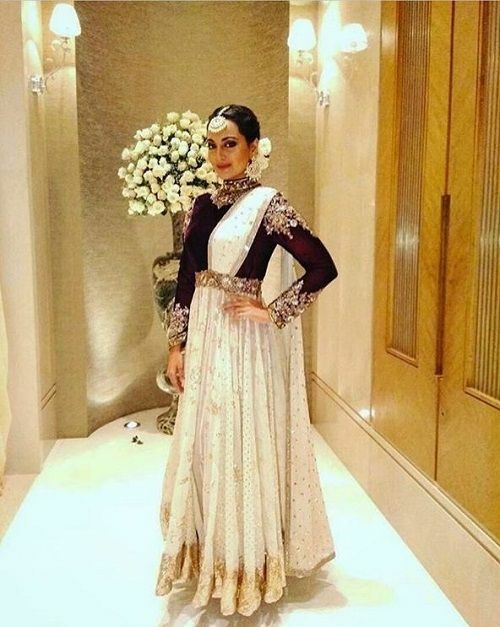 Image: Manish Malhotra World on Instagram Add some drama and swag to your shaadi style by opting to keep the sleeves of your blouse dramatic. Make them big, add a layer of frill or go for the cape style. Let the blouse be the hero of your outfit instead of the saree, itself. 5. Just like a lehenga! Image: Manish Malhotra World on Instagram You can even style your saree in a way that it looks like a lehenga. Trust us, that looks so pretty and oh-so-classy! Sonakshi Sinha looks rather hot in this lehenga-saree which is something you should totally try out this season. It is easy to wear and accessorize as well! Image: Raw Mango on Instagram Jewellery can make a great impact on your style statement. And there is no one better than Jacqueline here, to reiterate that for you. Wear an elaborate necklace to make your saree look more festive. You can even use contrasting jewellery. From silver jewellery to kundan sets, a saree is the right garment to experiment with! Image: Gaurang Shah on Instagram Give your blouse a 21st century makeover. Wear a modern looking blouse with your Banarsi saree and dazzle everyone. Alternately, grab a shiny, sparkly waistcoat and wear its backside on the front to make it look edgy! Image: Who Wore What When on Instagram You can do a lot by simply opting for a really colourful saree. The rest can wait! A jewel toned saree by itself, sans any elaborate jewellery or hairdo can do all the talking, ladies. A silk saree, like Vidya Balan’s here, looks edgy and traditional at the same time - perfect wedding wear, we say. 9. Go half and half! Image: Shilpa Shetty on Instagram Peachy pinks paired with icy blues are a colour combination that can never go wrong. Pair this up with edgy jewellery like ear cuffs, double finger rings and more. Try the colour blocking trend this way and you’re sure to stand out at the party! 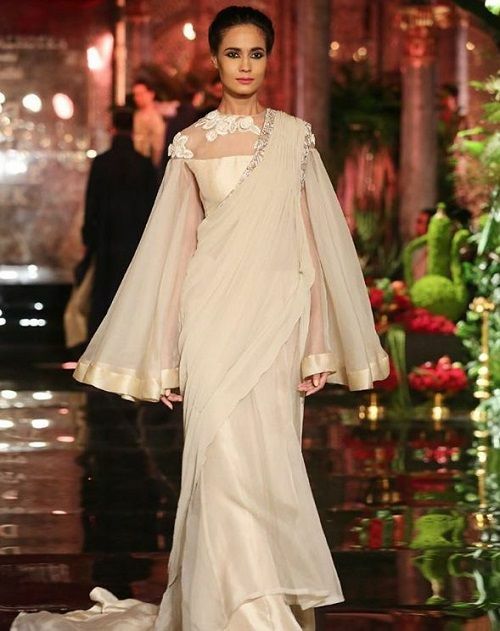 Image: Manish Malhotra World on Instagram A long jacket is a smart way to give the saree a formal and sharp twist. Add some volume to your garment with a trailing, floor-length jacket! This perhaps isn’t something many people would experiment with, but jackets sure are a foolproof way to give the saree a haute appeal, while staying warm during a winter function. 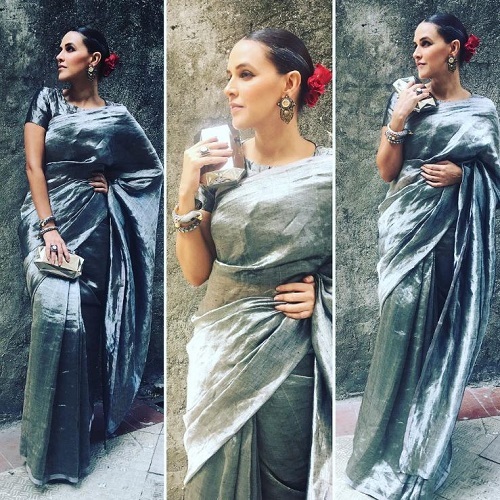 Image: Neha Dhupia on Instagram Add that little extra something to your saree. It doesn’t have to be a lot of jewellery or even a wacky twist. You can add oomph to your look by simply placing a few roses in your hair! You can match them with the colour of your blouse, or just opt for beautiful, red roses! 12. Drape it like a dhoti! Image: Payal Pratap on Instagram Yes, draping the same old saree in a brand new way can give it a new lease of life! So why haven’t you tried this trick already? Try draping your saree in a dhoti style, and get set to be the sartorial queen at that shaadi!